[1 FOXTEL] The first email from Adrian was him stating that the DROIDWORLD Facebook page was taken down by Facebook for breaching Clause 13 of Facebook’s Commerce Policy. “Courts in the UK and Europe have held that Kodi boxes combined with add-ons that carry unauthorised channels are illegal. See the extracts of the EU Court of Justice and UK judgments attached. He ended the email urging us to ‘cease and desist’ from distribution of boxes. 1) DROIDWORLD devices DO NOT come pre-loaded or pre-installed with any third party KODI Addons what so ever. 2) Users are able to use a third party installer of which we have thoroughly inspected to not contain any apps which provide copyright material – users have the choice to run this installer if they wish to do so – the installer simply installs third party apps which index FTA content – & also prompts the user to check their local laws regarding streaming content in their jurisdiction, with a confirmation required before allowing the user to utilize the installer. 4) DROIDWORLD is not the creator of third party apps in question, nor do we redistribute any streams what so ever (nor are our devices pre-installed with apps or used to facilitate or encourage unauthorised access to digital media). 5) You are claiming that any Android TV Box with ‘Kodi’ installed is a copyright infringement device > absolutely not. I suggest you head over to the Kodi website and see their stance and official FTA Addons publicly available. Kodi is available on the Google Play Store & many other official market places. Kodi is also sponsored by NVIDIA. If Kodi on the other hand is pre-installed with third party addons which provide copyright material > then yes, your claim would be correct. However, this is not the case. 6) Adrian, you are the senior legal counsel of Fox Sports Australia – I would not have expected blatant lies and deliberate perjury coming from you directly. Your scare tactics, false allegations & illegal take-down of our social media has impacted our business financially and as a whole. This is indeed Unconscionable conduct and anti-competitive behavior, and you sure know it. I have also been informed that you have taken down a number of sellers of Android TV Boxes in Australia from Facebook, plus one other website. Whether they pre-installed apps which provide copyright content is not of my knowledge, however, it does indeed show that you have acted recklessly in this matter. JBHiFi sells an Android TV Box with Kodi pre-installed (MINIX), why have you not attempted to shake up the big guys ? You have pointed to an article which relates to someone selling devices that provide access to premier league BT Sports and SKY. Our devices do not provide access to any apps which provide BT, SKY, FOX or any other unauthorised sports / copyrighted material. Why are you placing us in the same bag, when clearly you do not have any knowledge about us other than assumptions. Again, you have pointed to an article which relates to a company that was providing unauthorized access to pay-tv premium channels in the USA – where the exclusive rights of those channels were owned by DISH network, with fees needed to be paid in order to watch. In the article you have provided above; if someone was residing in the USA, and they wanted to watch ‘example channel’, if they visited the ‘example channel’s official website, they would be unable to watch ‘example channel’ on the official website or authorised websites (legal sources). The websites would not offer a free official stream available to the public. Instead, the site may say something like “Subscribe to DISH to watch Live”. The company in the article above, provided a way to illegally bypass the need to purchase a subscription from DISH to watch those channels. However, third party apps accessible via the third party app installer on our devices > do not function in this way. They only index official free to air sources of which are publicly available and open to members of the public. Foxtel does not own the exclusive rights, nor do they require a fee to be streamed – otherwise they would not be available to the public. 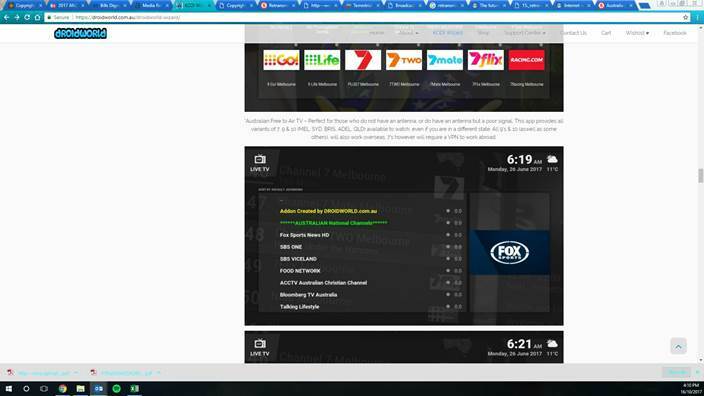 If someone is legally able to visit channel 7 on their PC and stream all the channels offered, why are you deeming it to be illegal for them to access channel 7 on our devices or on their TV’s. Again, we do not re-transmit or distribute channels > the apps provide an easy to use interface to browse the web and browse an index of free to air content. The apps are not pre-installed on our devices either > we also explicitly mention on our website that we are not a streaming service provider, hence we don’t charge any fees. We sell android TV boxes – period. 1) If there is indeed an infringement of Foxtel’s intellectual property/copyright/trademarks > please advise specifically which one has been infringed upon, and how it has been infringed upon exactly – in order to rectify the issue. We are happy to work with you on any dispute or error, but we are unable to do so when your claim is that our entire business needs to be shut down in your favour without any legal basis. You have made general (false) accusations and statements regarding our business as a whole – and appear to be ‘representing’ content which you do not own, utilizing scare tactics and sharing articles of copyright cases overseas (while i have already mentioned to you multiple times that copyright content is not accessible on our devices). If you claim that DROIDWORLD is infringing FOXTEL’s intellectual property, you must advise us of the actual IP you are referring too. If you can’t do that – it means that we are not in violation of any copyright/IP/trademarks. 2) If no such infringement exists, or if you have lodged the claim in error > please provide a written formal apology, which we request to be displayed on your website and Facebook page for a minimum of 7 days. You will also need to remove the false claim made to facebook to re-instate our social media account. [2 FOXTEL] The second email from Adrian Cannon @FoxSports / @Foxtel was pretty much about “Retransmission” of channels, quoting the laws and legislations of the ALRC. (They are saying that third party apps that index or point to legal, free to air content, require a broadcasting license, and need to pay royalty fees etc). He mentioned that it is illegal for apps to provide FTA content (free to air content) – which is totally not true. QUOTE: THE chief executive of Foxtel has launched a furious attack on plans to impose fees on the pay-TV company for transmitting the Seven, Nine and Ten networks, expressing frustration that proposed media reforms are stacked in favour of the main commercial broadcasters. QUOTE: “Why should we be charged a fee which is passed on to our subscribers for something that everyone else gets for free?” Foxtel chief executive Richard Freudenstein said. Im starting to think that Adrian Cannon is just a troll, or he’s using our arguments to help Foxtel fight off paying fees for free to air content. 1. As mentioned previously, we do not re-transmit channels and we are not a streaming service provider. 2. Third party apps which index FTA content are not illegal as you mentioned before, and they are not pre-installed on our devices either way. These types of apps are open source and are protected by fair use. Embedding or indexing FTA content does not require a broadcasting license nor are such app developers considered broadcasters (unless maybe if they have created a commercial streaming service it may be a case to argue). Does Google have a broadcasting license to index/point to live streams? There is an unofficial FreeView app on the Microsoft Windows app store – the developer does not have a broadcasting license… We are not affiliated with third party apps – and therefore should not even be having this conversation, as these apps are not pre-installed on our devices to begin with – nor are they apart of any purchase of a TV Box purchased from DROIDWORLD (you can find that loud and clear on the page you have taken screenshots from). 3. What is the definition of re-transmission ? Re-transmission is usually a broadcaster which captures the signal of broadcasts from an antenna/satellite/dish and re-broadcasts them on their own network to distribute to their customers, such as cable tv etc. The third party apps in question do not do this, and therefore are not even apart of the re-transmission regulations you have mentioned. They simply index/point to or embed the original stream – they are not duplicating or re-transmitting the original stream – it is the original stream embedded or indexed in the apps, not a re-transmitted signal. 4. We advertise what you can do with an Android TV Box – which includes utilising legal third party apps to access FTA content – there is nothing wrong with that, nor is that infringing on any of Foxtel’s IP. 5. Showing a screenshot of an app which has the Fox Sports logo would fall under fair use – but I would rather end the argument here and will have no problem in removing this entirely. a) It appears that you went on a reckless ‘take-down spree’ which included DROIDWORLD amongst other ‘android tv box’ sellers in Australia without actually checking whether they infringe upon Foxtel’s rights. You done this based on false assumptions that we are a ‘pirate box seller’ in which case we are not. b) You took down all the pages / facebook & other site/(s) with the possibility of them not having infringed upon any of Foxtels rights (as was our case) – in order to eliminate/scare & pressure any ‘android tv box’ seller out of business so that the Foxtel cartel can keep control of the monopoly they have created. c) After finally deciding to respond to my initial email (possibly after being contacted by the ACCC), you have scraped our website droidworld.com.au from top to bottom to try and find any wrong doing, and in the end have come up with a screenshot of an app that has a Fox Sports logo in it. Do you sincerely believe that you had the right to remove our entire business for approx 1 month now & counting, from facebook – due to having 1 app screenshot on our website which included a Fox logo that really falls under fair use ? We believe this is indeed ‘anti competitive behavior’ aswell as ‘unconscionable conduct’ which can be actioned by the ACCC . If the Fox logo was really the issue, a simple email could have had it removed in less than 24 hours – but we both know that the Fox logo had nothing to do with the take-down, nor was it/is it a concern. The goal was to eliminate sellers such as DROIDWORLD to take control of this market space – it is very clear what the intentions were/are. During this ordeal, you have made false accusations / allegations & statements about the business and you have affected both the business and myself greatly. I will remove all traces of the Fox trademark/s from the website and any other location & I expect you to remove the facebook claim. The slogan may look familiar to DROIDWORLD users, as it has been our slogan for years – featured in our old video commercial. 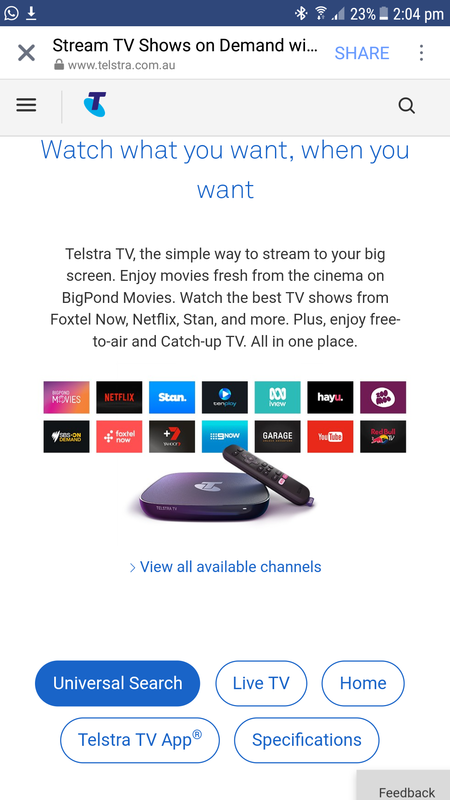 Not only has Foxtel removed our ability to advertise, market & engage with our users – they are even taking ideas from our existing/previous advertising campaigns and marketing material for the new Telstra TV Box. It is now very clear why Foxtel has taken this action against us, and also, against other Australian Android TV Box sellers (we won’t mention the names, but you know who you are). *Our sincere apologies to @LifeHackerAustralia for the initial assumption that the report was due to using their original article material on our page. Thank you for providing us with permission to share this material. We have contacted Adrian Cannon from Foxtel on the 18th of September in relation to the report. We have clearly indicated that our Facebook page and our last facebook post (including the entire DROIDWORLD business) were not in violation of Foxtel’s IP, copyright or trademarks. The email sent requested the reason for the report, the alleged infringement details DROIDWORLD has breached, details on how we can resolve the issue (if it exists), the reason why they alleged ‘droidworld’ as a whole infringes on ‘Foxtel’s IP’ so that Facebook would take down our entire page, rather than the specific post in question & more. Adrian Cannon is the Senior Legal Counsel for Fox Sports Australia – and has not responded to our email, indicating that they have no intention to justify their allegation – rather, they are pleased with the outcome of having removed our social presence. Social Media is now a crucial part of business, having that stripped away from us without legal boundaries by a bigger competitor is totally unfair. The removal of our social media accounts impacts our financial status, reputation & business as a whole. We are now taking this up with the ACCC on grounds of Anti-competitive behaviour by Foxtel and Unconscionable conduct – keeping in mind that falsifying an Intellectual property infringement, copyright infringement or trademark infringement is a serious crime. As was indicated in our email > if DROIDWORLD was indeed infringing the rights of Foxtel’s intellectual property, there is no doubt in our mind that Foxtel would have lodged a ‘take-down’ notice to our hosting provider (to take down our website). This wasn’t done, as no such infringement exists. DROIDWORLD believes that Foxtel is manipulating its power as a ‘monopoly’ to pressure its competitors and take complete control of this market. Taking down DROIDWORLD’s Facebook page, removing our social media presence, with no legal rights to do so is unlawful (while taking advantage of Facebook’s weak take-down system to do so) – we hope the ACCC will stand up against the Foxtel monopoly and provide the outcome we are looking for. This issue is far greater than a ‘facebook page’, rather, it’s about large companies applying unlawful pressure on small businesses without legal grounds (and getting away with it). By succeeding with such actions, they ultimately control the market, and limit what is available to Australian consumers – this also impacts pricing. For example, if you can watch X amount of free to air content (legally) on a DROIDWORLD Set top box (or any other Android Box), you may choose to cancel your Foxtel subscription (or change to a lower plan, for pay-tv content which is only available on Foxtel). If this increases, companies like Foxtel may decrease their pricing to attract more users. While if Foxtel uses scare-tactics and unlawful pressure to eliminate small businesses like DROIDWORLD > they will have no competitors, which can result in a price increase. DROIDWORLD operates fully within the law, we do not advertise the ability to stream or watch any copyright material. We do however advertise the ability to watch FTA (free to air) content using third party apps. For example, ACCTV is a popular christian channel > with many subscribing to Foxtel just to watch this channel. This channel is not a pay-tv channel, you can watch it free, anytime, anywhere, by visiting the official website: https://watch.acc.tv/ – DROIDWORLD Entertainment HUB’s provide the ability to access these free to air website streams on your TV using third party addons and applications. More & more Australian’s are coming to know that there is SO MUCH ‘free to air’ content available, not requiring any subscriptions for access – and it’s totally legal! It is important to note however that DROIDWORLD is NOT a supplier of any streaming content or apps, nor do they come ‘pre-loaded’ or ‘pre-installed’ by default – DROIDWORLD only sells Android TV Boxes, and users are free to use third party applications to access legal content. DROIDWORLD does not charge any subscription fees, as we do not provide any form of streaming service. Third party installers can provide an index library of available FTA addons/apps. If you are against companies like Foxtel creating an un-balanced playing field and using their power to create a monopoly – pressuring small Australian businesses out of business – then we recommend you also report Foxtel to the ACCC. You may use this page as a reference for your report, and include the information listed on this page in your report. Use the link below to report a business (Foxtel Management Pty Ltd, ABN: 65 068 671 938) that may be doing the wrong thing under the Competition and Consumer Act 2010. On Thursday 14th of September, we logged into Facebook only to find a message advising that our page has been removed due to ‘intellectual property infringement’ which was reported to Facebook. There was no information provided with the removal, no DMCA notice, no copy of the alleged infringement, and no chance to remedy the issue. Our last post on Facebook, which we believe is related to the take-down of our page, was sharing a news article relating to FOXTEL’s win to force a block of both streaming websites & torrent websites on Australian ISP’s (with permission from the author of the article, being @LifeHacker Australia). Sharing a news article does not violate ones intellectual property, so we are currently in the process of contacting Facebook’s IP manager to counter this claim, and obtain the details of the allegation and the claimant. Facebook is known to have taken down large corporations Facebook pages on false copyright claims (they do not check or verify the information, nor that the applicant is really who he claims to be). If the allegation turns out to be a hoax, or a malicious report from an unauthorized party pretending to represent a company or IP/trademark > we will take further action on the claimant if the allegation is not immediately removed. If the allegation was lodged by an authorized party, and has claimed ‘copyright infringement’, ‘trademark infringement’ or ‘intellectual property infringement’ where neither of these apply, please note that falsifying a copyright claim or trademark infringement is a serious crime with harsh penalties. Whether posting about this news article was the cause of the removal of our page is still a mystery – but this is the only logical explanation at the current time. Unfortunately we have not been provided with any information on the alleged breach, nor a copy of the complaint (literally no information). We would like to remind any rights holders to reach out to us before filing any types of complaints or disputes, as we will happily work with you to remedy and comply with any form of dispute. So what was the Facebook post about? Our last Facebook post was a summary of an article relating to FOXTEL’s win to force a block of both streaming websites & torrent websites (127 new websites added to the ‘blacklist’ including Yes Movies, Vumoo, Los Movies, Cartoon HD, Putlocker, ProjectFreeTV & 1337x) on Australian ISP’s. We feel the need to share such articles, as they affect all Australians. We do not support or encourage piracy, however, there are many legitimate uses for torrent websites – we do not support the censorship of the internet. We have been given permission by the good guys at @LifehackerAustralia to share their article. What does this mean for Kodi users? Kodi users may be effected by the block: Some third party Kodi Addons search the web for streams. The sites they search may or may not be in the block list > if the addons rely on sites which are indeed in the block list > then the result will be that you will have less streams/hosts available to choose from for various Kodi Addons (some addons may entirely stop working). There may be legal addons which search one of the hundreds of blocked sites, which is why we are providing this information to you (we don’t encourage or support the use of third party addons which provide copyright material). For tech savvy folks, simply change your routers DNS from ‘default provided by ISP’ to Googles DNS, which is: Primary DNS ‘8.8.8.8’ & Secondary DNS ‘8.8.4.4’, Done! Is it illegal to use a VPN? No, in Australia it is 100% Legal to use a VPN service. This is how companies such as ‘getflix’ provide the ability to access the american version of Netflix. It is legal to bypass geoblocking restrictions – for example, in China, people use a VPN to access Google > since Google is blocked there. In Australia, people use a VPN to access the american version of NetFlix. Although using a VPN to purposely allow the viewing of copyright material would not fall in this category of legality. You can use a VPN to unlock viewing of FTA (Free to Air) content, or other legal content. Using a VPN will also encrypt your traffic and provide you with safe and secure browsing. If you are still having the same issues after activating your VPN, remember to “clear cache” on any kodi addon that you want to use after activating your VPN. Some addons will store a ‘cache’ copy of ‘dead sites’ so that they wont waste time searching them again. Clearing ‘cache’ will give you a ‘fresh start’ when launching kodi addons (you wont lose any settings, passwords, or other tweaks when clearing ‘cache’). Shame on Foxtel.As of today I am cancelling my subscription of Foxtel which I have been a member of since 2008.I hope other readers can come to a conclusion similar to mine. Hello Droidworld, I’m so sorry that a progressive company like yourself, trying to provide a good service to the public as to undergo this kind of unrighteous opinionated crap, this is how some of the big company’s try to use there authority to kick the little guy down, this is not acceptable. All I can say is keep up the good work and keep your heads up you deserve all best in life as a company. Will never use foxtel ever. When I look at the Telstra TV box the remote has a certain familiarity about it. It seems to me that Telstra and Foxtel are just seeking to shut out the competition in their usual greedy fashion.